The story takes place in an dilapidated, industrial North Carolina town where whites and African-Americans live together in poverty. However, this film is not a depressing exploration into the failed American dream or the problems of surviving on little money. Green optimistically focuses his attention on the lives of five young people who each possess their own goals and thoughts about the world. They easily interact with the adults of the community and discuss the dreadful ghosts of both the past and the present. Still, the exuberance of youth pervades the tale even when tragedy strikes a central character. Everything may not work out perfectly, but hope still exists within the minds of the town's residents. Although the narrator is a girl, the film ends up focusing mostly on the boys. Nasia, her older sister, and her other friends, share humorous talk about boys, and a sense of togetherness. But the boys talk and act in ways that betray disconnection and emptiness. The first part of the film moves in the same wandering, seemingly aimless way as the characters. Then a sudden tragedy confronts the kids with a reality that they have trouble knowing how to deal with. • There are also three Easter eggs on the Cast Reunion screen: two clips of Curtis Cotton III (who played Buddy) bragging, and a set of baby pictures of the stars. • Commentary - this audio commentary with writer-director David Gordon Green, cinematographer Tim Orr, and actor Paul Schneider was also included on Criterion's R1 DVD release of George Washington. It was recorded in 2001. • David Gordon Green on Charlie Rose - in this archival episode of the Charlie Rose Show from 2001, director David Gordon Green discusses the unique themes of George Washington, the film's visual style, the cast and the locations that were selected to shoot key sequences, the film's success, etc. In English, not subtitled. (15 min). 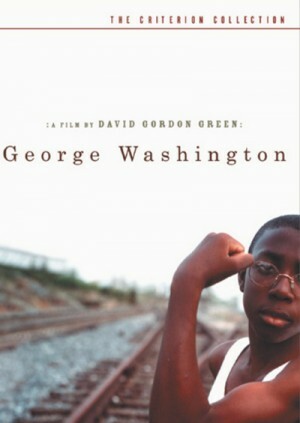 • Pleasant Grove - this short film directed by David Gordon Green was the inspiration for George Washington. In was completed in 1996, while the young director was a student at the North Carolina School of the Arts. The film is presented with optional commentary by David Gordon, cinematographer Tim Orr, and Paul Schneider. In English, not subtitled. (15 min). • Physical Pinball - David Gordon Green directed this short film two years after Pleasant Grove, again while he was a student at at the North Carolina School of the Arts. The film follows closely an African American father who suddenly realizes that his daughter has become a young woman. In English, not subtitled. (21 min). • A Day With the Boys (1969) - this very atmospheric short film, directed by Clu Gulager (The Killers) and lensed by Laszlo Kovacs (Ghostbusters), apparently was an influence on George Washington. The film is complimented by a terrific soundtrack. In English, not subtitled. (18 min). • Deleted Scene - a deleted scene with optional commentary by writer-director David Gordon Green, cinematographer Tim Orr, and actor Paul Schneider. In English, not subtitled. (9 min). • Cast Reunion - the archival footage presented here is from a cast reunion organized by Criterion at High Point, North Carolina in 2001. Director David Gordon Green interviewed the young actors who recall their contributions to George Washington and explain how their lives changed after the film was released. In English, not subtitled. (16 min). • Trailer - original trailer for George Washington. In English, not subtitled. (2 min).